Linework became widespread in the 1840s because of the use of the telegraph. The term ‘lineman’ was used for lineworkers who set wooden poles into the ground and strung the wire. In fact, that’s still what happens today to power the US electric grid. This is dangerous, technical work where safety is paramount not just because linemen work at height, but because electrical power carries with it the risk of electrocution. Another risk is that since linemen work in teams where one lineman is on the ground and one is at height, there is also the risk of being hit by a dropped object. Linemen face risks above, below and all around them. These enormous risks led to the formation of labor organizations back in the 1890s. It also led to the establishment of apprenticeship programs, which have fostered the brotherhood bonds in the industry. Starting in the 1930s, both of these groups worked hard to set up stricter safety standards making safety a priority ever since. Another challenge facing the lineworking industry is that much of the United States’ power grid is part of an aging infrastructure that needs to be repaired or replaced. With the increase in energy consumption, there have also been increased outages.1 For instance, from the 1950s to the 1980s, significant power outages averaged fewer than five per year. More recently this has changed. In 2007, there were 76, and in 2011, more than 300 outages around the country. Natural disasters play another large role in how much linemen are needed in the US. As the number of lines increases, because of the demand for more electrical power, so does the impact of frequent and severe weather hazards when they occur and damage these all-important power lines. Restoring utilities is a priority after natural disasters because cleanup work and daily needs require access to power. Severe weather is the number one cause of power outages in the United States, costing the economy between $18 and $33 billion every year in lost output and wages, spoiled inventory, delayed production and damage to grid infrastructure. For instance, more than 5,000 additional crews were sent from out of state to respond to Hurricane Irma in Florida.4 Lineworkers are a critical first line of recovery needed to support cleanup efforts after a storm. Lineworkers consider this line of work not just a job, but a lifestyle. The people who take up this skill know it is a deliberate choice to work in this extremely dangerous industry. There is a strong sense of brotherhood and community because so much is “on the line”. They belong to trade unions and other membership groups that celebrate this profession for its risk, commitment to hard work, and specialized training needed to complete the job properly. 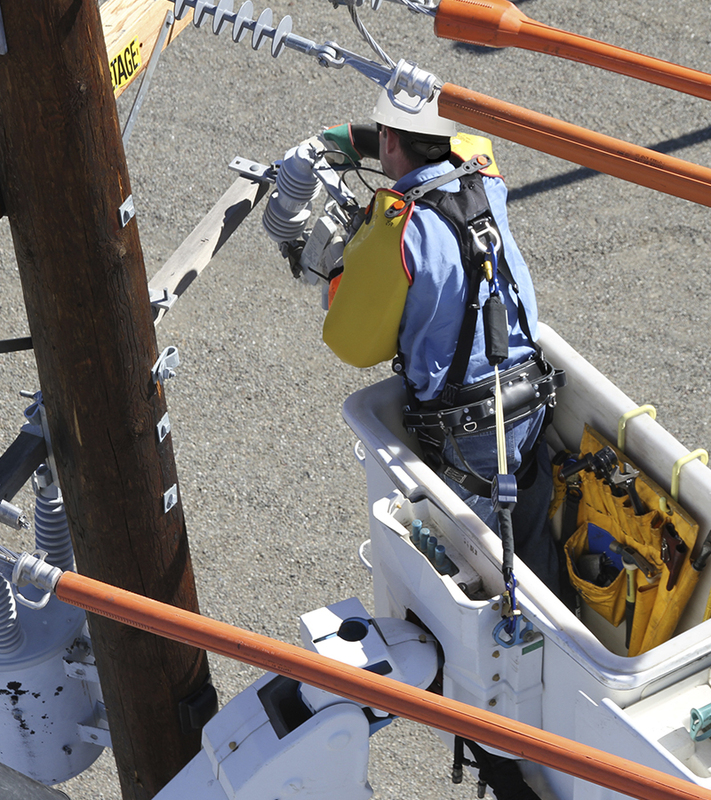 People considering a lineman career will typically complete one year of schooling followed by a four-year apprenticeship to become a journeymen lineman. The training centers where education begins can be technical schools or courses offered through community colleges and universities. There has been significant growth in the number of new training centers and the instructors are often former lineworkers. It is critical that experienced lineworkers share their best practices to prepare this new workforce for life on the line. These brave workers are the key to success when it comes to new hires because of their skill, expertise and institutional knowledge that they can impart to new trainees and apprentices. There are concerns on how to bridge this knowledge gap. It is also getting harder to recruit people to become linemen because of the dangerous nature of the work and there are many other jobs available that pay more and do not come with anywhere near the same amount of risk. Those that do choose to be part of this unique industry need to be assured that they will be kept safe. They must have access to qualified training and quality fall protection products and other personal protective equipment (PPE). As a new worker, it is crucial to be outfitted with a significant amount of PPE in order to perform this dangerous job safely. This includes the right safety harnesses, safety lines and fall protection for tools accessories such as buckets and hooks. To help tomorrow’s lineworkers gear up for their career, learn more about the PPE available today and check out the video below from Tower Climbing Grease Monkeys of a 3M Truck Demo showing some of these tools to consider for those who decide to pursue a life on the line.